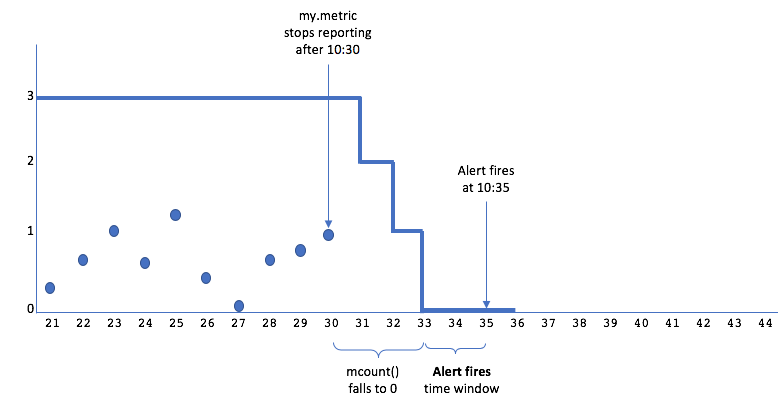 Configure an alert to fire when a time series stops reporting. Part of monitoring a system is to configure alerts to let you know about machine or application faults. When a machine or application crashes, it stops reporting data to Wavefront. In effect, the data we expect from that source is missing. This page can help you understand how to configure alerts to detect missing data, so you can identify potential failures and resolve them before too much data is lost. When a time series stops reporting, we see NO DATA where we expect to see data points. We refer to these expected but unreported data points as missing data. A time series might stop reporting data because the source of the series (an application, service, or host machine) has crashed and can no longer generate data points or send them to Wavefront. An application might malfunction intermittently so that it repeatedly stops sending points for short periods of time before resuming. Brief interruptions that resolve on their own. For example, a time series might skip data points because a minor network problem has dropped a few packets. Sensitive enough to detect missing data in time to avoid significant downtime. Robust enough to ignore brief, insignificant interruptions. Alerting on an entire group of time series that fail together. Alerting on one or more individual time series within a group. Note: Sometimes a gap of NO DATA in a time series means that data reporting has been delayed, but not completely stopped. If you need to alert on a time series that is subject to data delays, you can configure the alert to minimize their impact. You can configure an alert to notify you when a group of time series all stop reporting data. To do so, you create a custom alert target with the trigger set to Alert Has No Data. Suppose you are collecting a metric my.metric from 2 copies of a service that are each running on a different host machine (app-1, app-2). You aren’t concerned if either app-1 or app-2 fails by itself, but you need to know if both sources fail concurrently. Create a custom alert target whose trigger is set to Alert Has No Data. Create the alert with Condition set to ts(my.metric), and Alert Target set to the custom target. If both time series stop reporting, the alert does not fire, but enters a NO DATA state. As a result, we send a notification to the custom alert target. Use the mcount() function to measure the number of reported data points, relative to a chosen time window. Compare the count to 0 (or some other threshold). The mcount() function updates its count continuously by shifting the time window forward in time and then counting the number of data points that were reported in the now re-positioned window. The process of returning an updated moving count is repeated once a second, regardless of how frequently the time series reports its data points. This alert condition returns true if my.metric does not report any data points for 3 minutes on at least one source. Different amounts of missing data can indicate the severity of a fault. In general, a complete failure to report data is more severe than an intermittent failure. You can detect different amounts of missing data by picking different comparison counts for your alert condition. Note: You base the threshold on the number of points you expect the time series to report in the chosen interval. The expected count is easiest to estimate for a time series that reports regularly, such as once a minute or once every 20 seconds. To find out whether a time series is reporting fewer and fewer points over time, compare the current moving count to a moving count from an earlier part of the same time series. See Alert on Point Rate Drop on the recipes page. The alert condition is mcount(3m, ts(my.metric)) = 0, so the shifting time window is 3 minutes. Alert fires time window is 2 minutes. mcount() counts 3 points in every 3-minute shifting window through 10:30:59. Then the moving counts decrease over the next 3 minutes: 2 points through 10:31:59, 1 point through 10:32:59, and finally, 0 points at 10:33 and beyond. The alert checking system combines the per-second moving counts into summarization points: 3 at 10:30, 2 at 10:31, 1 at 10:32, and 0 at 10:33, 10:34, and so on. When the alert condition compares each summarization value to 0, the result is false until 10:33. The alert fires at 10:35, based on 2 minutes’ worth (10:33 and 10:34) of true values and no false values. The total elapsed time between the last reported data point and the alert firing is 3+2 = 5 minutes. Note: The elapsed time will be shorter for an alert condition such as mcount(3m, ts(my.metric)) < 3, when the Alert fires time window can overlap the shifting time window. Short enough so that you don’t wait too long for the alert to fire after the time series stops reporting. Long enough so that the alert can ignore slight variations in reporting times or extremely brief reporting gaps. Note: Always make the shifting time window longer than the data-reporting interval of the time series.